Hey! I hope you're having a lovely week. Things are crazy-busy here in The Granola Chronicles household! We're so blessed though...I really can't complain! 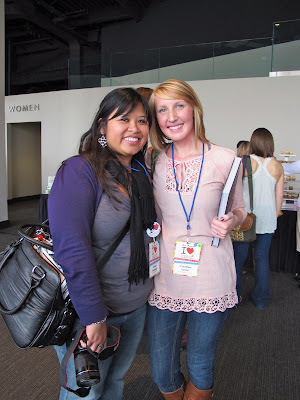 I want to briefly share my thoughts on the 2011 Foodbuzz Blogger Festival. I mentioned on Monday that it was one of the best weekends of my life. I met so many amazing women (yes, there were men too - but mostly women! ), and I enjoyed getting to know the ladies behind my favorite blogs + new ones. Food is so very powerful. It has the ability to bring people from different backgrounds and walks-of-life together. It's a beautiful thing. I felt so comfortable meeting new people, as we had one thing in common from the start: a passion for food! Love Krystal - such a gem! Logistically, the whole weekend was planned so well. We literally just had to show up to the events, and everything was ready for us. The food was great, as well as the open bars (which we definitely enjoyed)! If you're thinking of attending Foodbuzz in the future, I can't recommend it enough! It's a great way to meet new people, learn about new blogs and discuss the latest trends in blogging. Oh yeah - and you eat a ton of food. It's fabulous. Have you ever attended a blog conference? !